It’s 7 AM here; I have been pulling an all-nighter after watching two movies in a row with my friend; crazy eh? While he is sleeping it off, I am sitting here, all excited, about to jump off my bed. Why? Something unprecedented happened (for me). 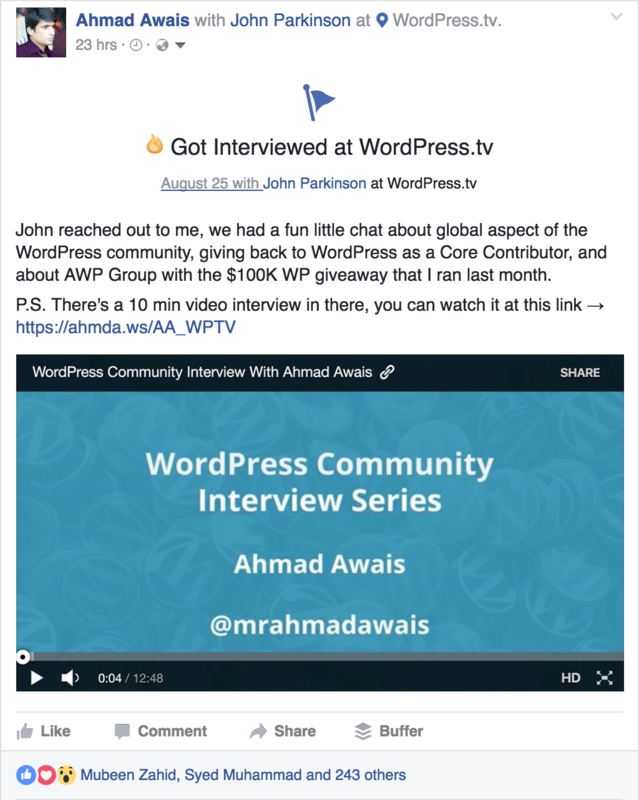 Just about two weeks ago, I got to know about this incredible WordPress community interview series at WordPress.tv’s blog conducted by John Parkinson — who BTW has been contributing at WordPress TV for more than two years now. I heard that my friend Matt Cromwell was talking about AWP group’s giveaway in his interview along with Jeff Matson. Since I was the one who managed that giveaway, I was looking forward to what Matt had to say about that. And he did talk about me. I have to admit; he has always been so very considerate of me, like when he mentioned _child during his WordCamp Los Angles 2015 talk. Anywho, where were we? Oh! My interview. So, later that day John reached out to me, and we ended up scheduling an interview. I love to talk about WordPress. Seriously, I can go on and on about everything WP. I am share-what-you-know-kinda-guy. You can find me talking about WordPress as a career, contributing to the core, sharing, and building all kinds of WordPress stuff all day long. 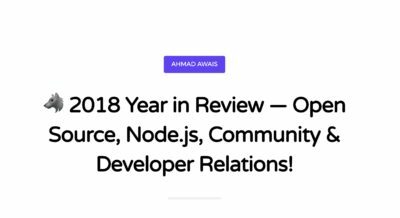 So, we had this fun little chat about global aspect of the WordPress community, contributions to FOSS free and open source software, and even the WordPress Week I arranged in 2014. You might enjoy watching this 12 minutes interview and get to know more about me and what I stand for. I shared my interview on my personal profile at Facebook, and the response I received was ten folds what I could ever have imagined. Seriously, though, even my parents called me tonight to tell me how proud they felt. It was very much reassuring; considering that my dad is a doctor, and my mother teaches Urdu Literature as a professor in Higher Edu. — that is they are not related to my field. That said, I have been active in the local community and entirely focused on one thing i.e. WordPress. I think giving back to the community and teaching everyone about WordPress — as a 24/7 evangelist — has finally started to build me a bit of an audience; enough to make me feel humbled and honored at the same time. Moreover, I think I have what I call a 2D connection with the WP Community. Let me explain. I have never been to a WordCamp (so many reasons to why, I could write a complete post about it — but that’s about to change, I have plans for next year IA). I think that’s why my interview got viewed so many times which got me featured on WordPress.tv’s homepage among the most “Popular Videos”. 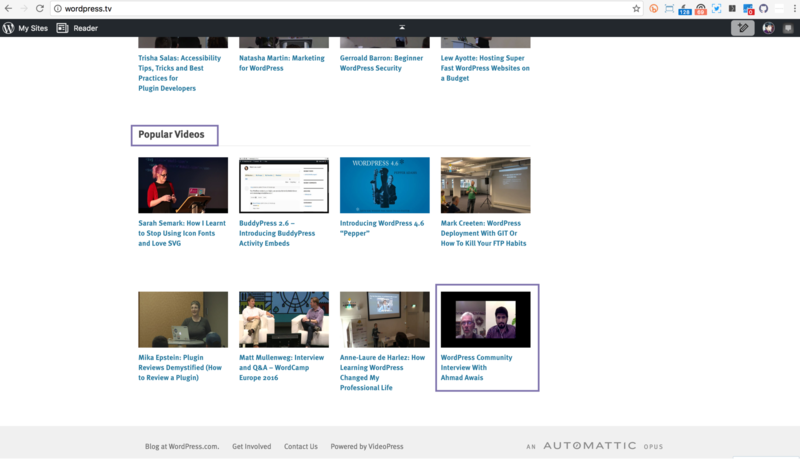 One moment, I didn’t have a single video at WordPress.tv and then 24 hours later being featured there on the homepage goes to show things are that transparent here. It’s incredible! For me it is! I gotta celebrate that; today I do! ? Receiving such an extraordinary response to my interview was completely unexpected. I just want to thank each and every single one of you; those of you who watched the interview and yes, for all the kind words & help. Thank You! ? Thanks a million! ?